When a 17-tonne lorry ran over 37-year-old Robert Williamson, the injuries to his legs and pelvis were so severe he wondered if he would ever walk again. London Ambulance Service staff who responded to the road traffic accident on Streatham Hill immediately assessed that Robert needed specialist care as quickly as possible. Once they’d given him pain relief and called for back up from London’s Air Ambulance team, staff decided to take Robert directly to the major trauma centre at St George’s Hospital, Tooting. 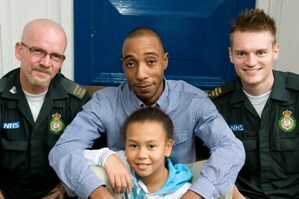 The specialist team at St George’s was ready to continue Robert’s care when he arrived by ambulance. One year on, Robert was walking again when he and his nine-year-old daughter Rhea met two of the ambulance staff that treated him – Emergency Medical Technician Neil Blackwell and Student Paramedic Graham Clark. Robert said: “Initially the doctors told me that if I was able to walk again I would definitely have a severe limp. “Fortunately that isn’t the case now, but it was very bleak at the time, I had a lot of extreme pain. If I didn’t have access to the major trauma centre I might not be walking at this point.